In times of tumult and confusion, those who speak the truth are often consigned to oblivion because their words are far painful for those in power, threatening to awaken them from their illusions. When the world is in need of truth, however, we must come together and remember such individuals. Yamazaki Ben'nei (1859-1920) was a prominent priest of the modern Jodo (Pure Land) sect known for his research and development of Buddhist monasticism and theology. He was a reformer who willingly lived outside the institutions of his sect in order to devote himself to resurrecting in the present the original traditions established by Priest Honen (1133-1212), founder of the Jodo sect. He was also a pure-hearted missionary who lived as a spiritual leader among the common people. 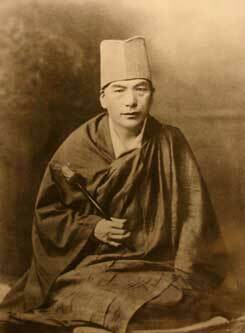 His beliefs in Buddhism led him to learn from other religions and philosophies. This brief sketch provides only a fragmentary glimpse of this important figure. Yamazaki left copious writings. These, along with lectures he gave in various places, were edited and compiled after his death by leading disciple Tanaka Mokusha and published in more than ten volumes. Yamazaki also left behind many paintings and works of calligraphy, which were not done as a leisure pastime, but along with his lectures and writings, are a central part of his teachings. The teachings of a deeply religious person are not always expressed in the spoken or written word. Yamazaki's calligraphy and paintings are embodiments of teachings that could not be written down in words. The year 2010 marks the 90th year since Yamazaki Ben'nei's death. Today, not very many people know about Yamazaki other than the followers of Komyo Shugi, a sect that he established. These works of art and calligraphy are his testament, and their role will only be fulfilled when they are seen and their inspiration acted upon. This testament is still waiting to be "read" and made known to an even greater number of people. This exhibition features not only the works of Yamazaki Ben'nei, but also letter, manuscripts, and the accordion he played during his activities as a missionary. All of these will also be featured in a bound publication available at the exhibition. 16 Izumi-cho Gifu-city Gif pref.